Roman Holiday (1953) is coming to the big screen this week in select theaters across the U.S. Here's the story behind the all-time classic romance starring Audrey Hepburn and Gregory Peck. Roman Holiday (1953) is one of old Hollywood's most beloved films, featuring a star-making performance by Audrey Hepburn and beautiful location shooting in the Eternal City. Now, those living in the U.S. have the chance to watch Roman Holiday on the big screen. TCM and Fathom Events are bringing the film to select theaters across the nation on Sunday (Nov 29, 2015) and Tuesday (Dec. 1, 2015). Roman Holiday stars Hepburn as Princess Ann, a prim and proper member of an unnamed royal house who grows tired of her seemingly endless duties. On a visit to Rome, she runs away in the middle of the night and. through a series of comic events, ends up staying with Joe Bradley (Gregory Peck), a down-on-his-luck reporter who realizes that Ann is the big scoop he needs to turn his career around. Roman Holiday seems like the perfect old Hollywood fairy tale, but it had a long and winding road to the silver screen. The original script was written by blacklisted screenwriter Dalton Trumbo shortly after he was released from prison for refusing to co-operate with the House Un-American Activities Committee's investigation into alleged Communist sympathizers in Hollywood ( for more on Trumbo, you can read my article for Film Inquiry). Trumbo needed some fast cash, so he quickly churned out an original screenplay about an overworked princess that was no doubt inspired by the unprecedented publicity surrounding Princess Elizabeth, later Queen Elizabeth II, and her glamorous sister, Princess Margaret. Trumbo was still blacklisted, so he asked his fellow screenwriter Ian McLellan Hunter to put his name on the screenplay and sell it on Trumbo's behalf. Frank Capra quickly snapped up Hunter's offer because he felt the script was similar to his classic romantic comedy It Happened One Night (1934), but he eventually lost interest in the project. Some sources say this was because Cary Grant wouldn't play the lead or because Paramount Pictures wouldn't give him a large enough budget, while others state that Capra found out who really wrote the screenplay and was anxious to avoid negative publicity. 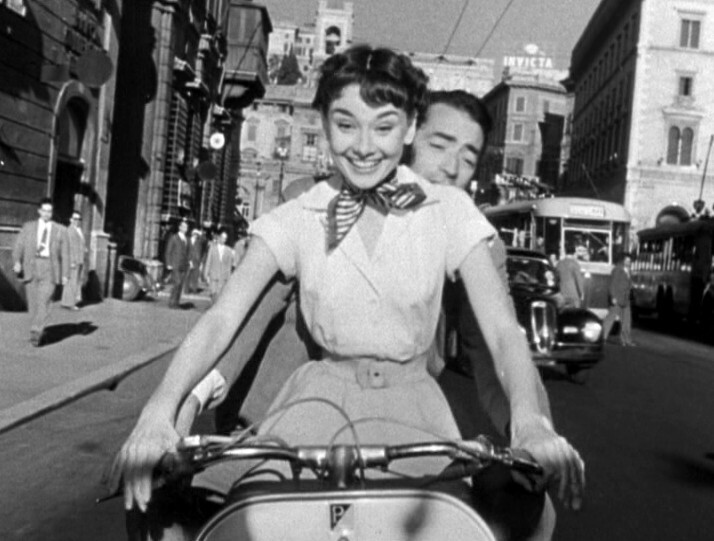 Audrey Hepburn and Gregory Peck take a Vespa ride through the streets of Rome. Whatever Capra's reasons, the project eventually landed in director William Wyler's lap. 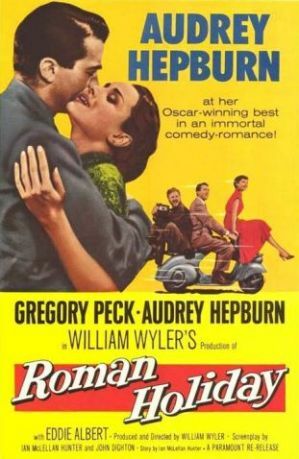 Wyler was primarily known for dramas, but he was interested in Roman Holiday because he wanted to try his hand at comedy, and he wanted to film a movie on location in Rome. Wyler ran into roadblocks right from the start. Grant flatly turned down the role of Joe Bradley for a second time (he was not happy that the princess was the center of the story), so Wyler approached Peck , who also thought that the part of the newspaper reporter was a thankless task. Wyler finally got Peck by needling him with the response, "I didn't think you measured the length of a part?" Wyler had an equally difficult time finding the perfect Princess Ann. His first choice was Elizabeth Taylor, but MGM wouldn't loan her out to Paramount. He then became a champion of Jean Simmons, but billionaire Howard Hughes had Simmons under an exclusive contract and wouldn't loan her out either. Wyler then went on an European tour to look for a new discovery to play the princess. Meanwhile, Paramount Pictures production chief Richard Mealand was pushing a young Belgian born actress named Audrey Hepburn, whom he had seen in a small part in the British movie, Laughter in Paradise (1951). Paramount gave Hepburn an unusual screen test -- she was interviewed after acting out a scene in the script -- that allowed her natural charisma and youthful radiance to shine through (clip below). Wyler's verdict was "absolutely charming," and, from that moment, Hepburn was the only choice to play Princess Ann. 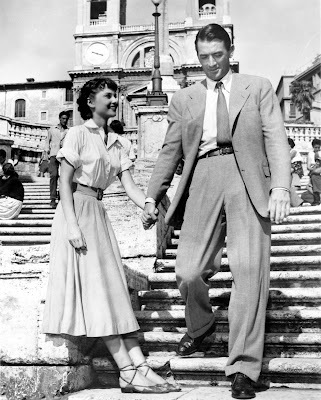 Wyler also had a difficult time convincing Paramount executives to allow Roman Holiday to be filmed on location. The penny pinching front office wanted to film in Hollywood with a few establishing shots and rear projection shots thrown in for local color. Wyler would have none of it. "You can't build me the Colosseum, the Spanish Steps. I'll shoot the whole picture in Rome or else I won't make it." he said. Wyler won out, although he still had to get past Italian officials who didn't like the script because they felt it made fun of everyday Italians. Wyler eventually persuaded government officials that Roman Holiday also poked fun at European royalty and American journalists. "It's a comedy," he told the reluctant bureaucrats. "We make fun of everybody." Once filming began in the summer of 1952, it was a wonderful experience for everyone involved despite the fact that British screenwriter John Dighton re-wrote much of the script on the fly. Many of the cast and crew, including Peck and co-star Eddie Albert, brought along their families for what became a memorable summer vacation. "Working for Willy in Rome was nothing but joy," remembered Albert, who played a wisecracking photographer. "It was a pity to take the fee." Roman Holiday was a huge hit when it was released in September 1953. Hepburn became an international sensation, and young women everywhere copied her short hair and chic clothes. Ironically, Princess Ann's experiences mirrored the real life travails of Princess Margaret. She was in love with World War II hero Group Captain Peter Townsend, but because he was divorced and a commoner, their romance was controversial. Margaret eventually decided not to marry Townsend so she could continue her royal duties, but she led a somewhat unhappy life until her death in 2002. 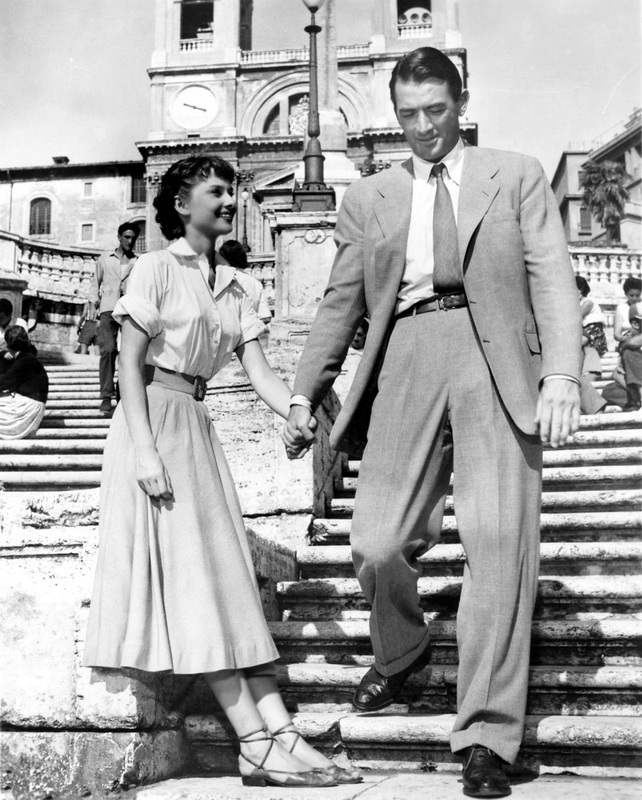 Gregory Peck and Audrey Hepburn in a publicity still for Roman Holiday (1953). Roman Holiday was nominated for 10 Oscars and won three: best actress for Hepburn, costume design for Edith Head, and best original story, which was given to Hunter instead of the still blacklisted Trumbo. The academy finally awarded Trumbo's widow his statue in 1993, and Trumbo was finally given an onscreen credit for Roman Holiday in 2011 (if you go to the theater, you'll see his name under "original story by" during the opening credits). My sources for this article are Audrey: Her Real Story by Alexander Walker and the American Film Institute notes. You can check for Roman Holiday showtimes and tickets here. If you can't make it to the theater, Roman Holiday is streaming on Netflix, and it is available on DVD. Thanks for this riveting piece. Roman Holiday is one of my favorite movies of all time.